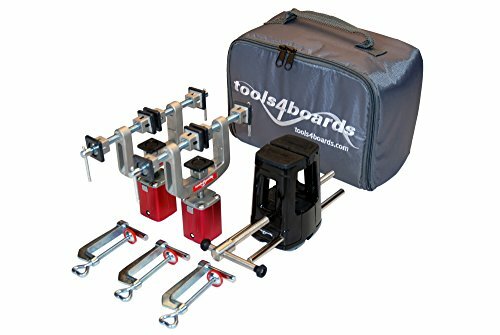 Tools4Boards FIX One is the most innovative, versatile 3 point vise for securely holding all skis and snowboards including alpine, cross country, backcountry, alpine touring and telemark skis. Lightweight high-tensile aluminum vise features brass threaded inserts, bronze self lubricating bushings and stainless steel handle Features patented Symmetric Clamping Technology - dual actuating jaws are self-centering, quick to adjust and allow ski or snowboard to always remain centered on supports Extra-wide center jaws open to 5 1/2 Inch (145mm) easily clamping even the widest waist skis, ski bindings or binding plates Sturdy high-tensile aluminum and stainless steel height-adjustable supports feature patented 3-way clamp design and modular Spindle Technology - simply push button to adjust support height Clamp plates with durable wrap-around natural rubber pads pivot to adapt to positive, neutral or negative ski or snowboard camber, are quick to adjust and allow firm, stable side placement Vise components are securely fastened to any tabletop with a thickness of 2.5" (63mm) or less. Includes durable zippered padded nylon travel case with plenty of pockets to stow tools and wax Compatible with Terminator Tuning Stand (sold separately).